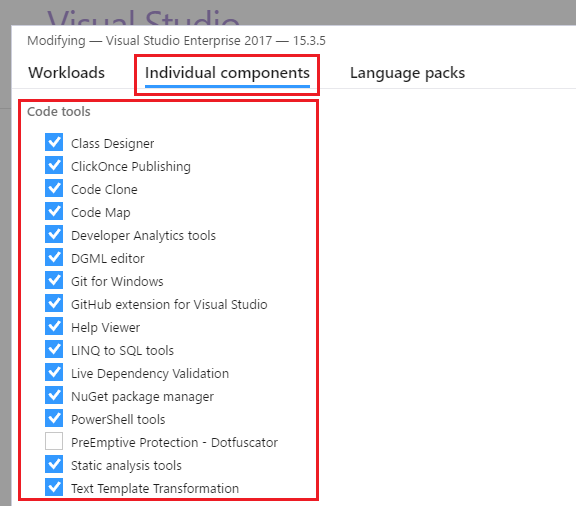 What Happened to the Architecture Tools in VS 2017? Hmm… Loaded a .NET project from GitHub into Visual Studio 2017 Enterprise Edition and went to drill into its underlying architecture, but realized that the “Architecture” menu item and tools were missing! Keep in mind that these are advanced features found in the Enterprise Edition of Visual Studio that enable you examine the architecture of a given solution. 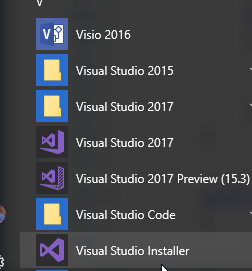 To get to this feature, you have to do a little bit of configuration effort..
First, in your Start Menu, look for the Visual Studio Installer application, as highlighted in the image below. Visual Studio 2017 now include this Installer Application as the primary mechanism to modify and update Visual Studio. Once the Installer application opens up, click on the Individual Components menu item, scroll down to the Code Tools section and check the available applicable options, as shown below. Finally, click on the Modify button, restart Visual Studio and your old buddy, the Architecture menu item, should be back.